With some questionable luck, I managed to get into the press screening for “Bad Times at The Royale” in my country Friday (I say questionable, because I’m no longer an official member of the press, but they still have me on record, and most don’t even bother to check. Anyway). My short review for “Bad Times at the Royale”: I loved it, but it was way too long. Let me explain. I saw the trailer for the movie a couple of months ago and was intrigued by the storyline, the editing of the trailer and its cast. I put it on my To See list immediately, although I don’t usually watch thriller, almost horror movies. Cue yesterday, and here I am in a movie theater, 2 minutes late to the screening and a bit pissed off I missed them (so sorry if those minutes were crucial to the movie plot and this is not a complete review). The movie starts with the check in of our characters in this special, quirky hotel. 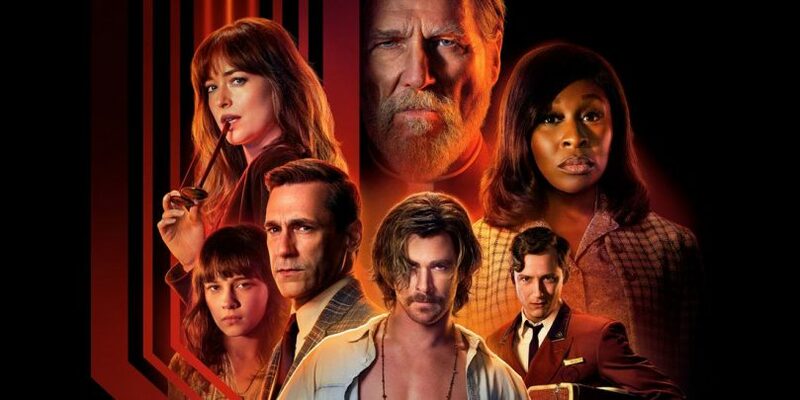 We have Father Daniel Flynn (Jeff Bridges), cautious Darlene Sweet (Cynthia Erivo), salesman Laramie Seymour Sullivan (Jon Hamm) and bitchy Emilly (Dakota Johnson). I won’t go into a lot of details, because I would have to give spoilers, but let’s just say that all of them have an ulterior motive to be there and the plot thickens whilst we figure out what each character actually wants to do in that hotel. Except maybe Darlene Sweet, who seems to just be in the wrong place at the wrong time, but she goes with the flow and survives the situation the best she can. “Bad Times at the Royale” has an interesting story, with great characters and even better performances from the actors. I especially loved Jeff Bridges (who shows a great mix of grit and kindness), Cynthia Erivo (who has an absolutely fantastic voice), and Lewis Pullman (who plays the hotel clerk and probably gets his talent from his famous father- Bill Pullman). I also enjoyed Chris Hemsworth’s performance because, although it seemed like he was playing a similar character to his actual personality, I think he used his perceived goofiness and easiness to his advantage to lure in people to his cult. It definitely worked in this context (one my favorites parts is Darlene’s comments to his behavior towards the end of the movie, where she figures him out and outs him; great performances from both). Visually, it was a pleasure to watch: the cinematography is on point and suitable to that time, and the shots were so well directed. My biggest problem was the pacing, or better said, the duration. It was a 2h 20 min movie that could have been a 10 in my book (and probably most of the others, too), if it was 30 min shorter. The beginning was dragged, maybe just to provide context and create connections between the audience and the characters. Some of the flashbacks were too long and unnecessary, and although I loved hearing Cynthia’s voice and I understand how the director constructed the scene in order for the singing to work, everything could have been shorter. It just dragged so much in places, that I could feel myself and the audience getting bored and restless (“yeah, i get what you mean to do, but can you make it faster?”, seemed to think most of us). So, overall, “Bad times at The Royale” is great and I think film buffs will appreciate it, but most people, the general audience, will leave that movie theater thinking it was a waste of time. Ok movie, but too long. I was worried about that length :/ I’m still super psyched for it, if it’s anything like Cabin in the Woods I will love it! I haven’t seen Cabin in the Woods, but I was pleasantly surprised by the directing in this one. I think you’ll like it!